This product is a travel Power Strip. It accepts voltage from 100V~250V, but cannot convert voltage. - Anti-thunder and electric surge protection designed to keep your electronics safe. - 2 AC outlets and 4 USB ports with integrated fast charging technology - 2.4A each. - Fail proof built-I IC that protects your devices from short circuiting and overheating. - This multiple charger has a sleek and slim design made out of Fireproof PC & ABS plastic. - High efficiency in electric energy conversion due to synchronous rectification technology. - Anti overload circuits shut off the international travel plug adapter to prevent damage to your cell phones and electronics. PowerBear aims to reach the highest limits of customer service! If there is ANY REASON why you are unhappy or unsatisfied with ANY of our products, we guarantee you a replacement within 2 years! Please Use our product with only high quality charging accessories. Poor accessories might cause a wrong current to leave the product causing it to malfunction. GO BEYOND YOUR POWER: Stay connected anywhere you go with the PowerBear charging station and surge protector power strip. Plug in up to 2 AC devices and 4 USB cables at a time for your very own device charging station and USB charging station. Be ready for any scenario with an excellent source of power, this travel AC adapter give you the ability to Go Beyond Your Power! 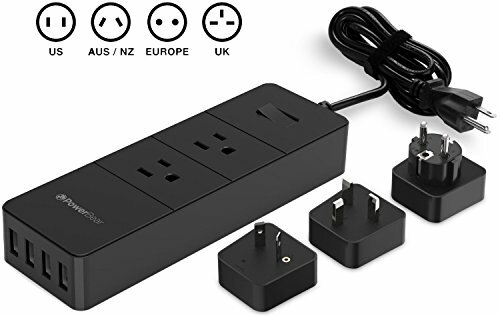 UNIVERSAL COMPATIBILITY: 3 International travel adapter and converter enables you to use the power strip surge protector in North America, United Kingdom, Europe, Australia, China, India, etc. Our world travel adapter means you can stay powered in more than 150 countries worldwide. EASY TO USE: This AC USB power adapter is extremely easy to install. Just select your international travel adapter cable and snap it unto the cable. Then plug the cable into the outlet, flip the switch, and enjoy your new charging station multiple devices. High quality plastic ensures that the adapter remains intact and working after drops and impacts. SAFETY ASSURANCE: This AC USB charger is FCC and RoHS certified. The plastic casing is made from fire-resistant PC & ABS plastic with overload protection. The 2 AC outlets are rated at 2000 Joules and defend against voltage fluctuations, surges, spikes, and drop-offs. 24 MONTH WARRANTY: PowerBear stands behind our products. If you are not 100% satisfied with your new power adapter, just let us know! Contact us via Amazon and we can help with any issues that you may have. Customer satisfaction is our top priority, and that's the PowerBear guarantee! If you have any questions about this product by PowerBear, contact us by completing and submitting the form below. If you are looking for a specif part number, please include it with your message.